31 Days. Not long till the World Cup starts, and Steven Hansen has some tough decisions to make at fly-half. 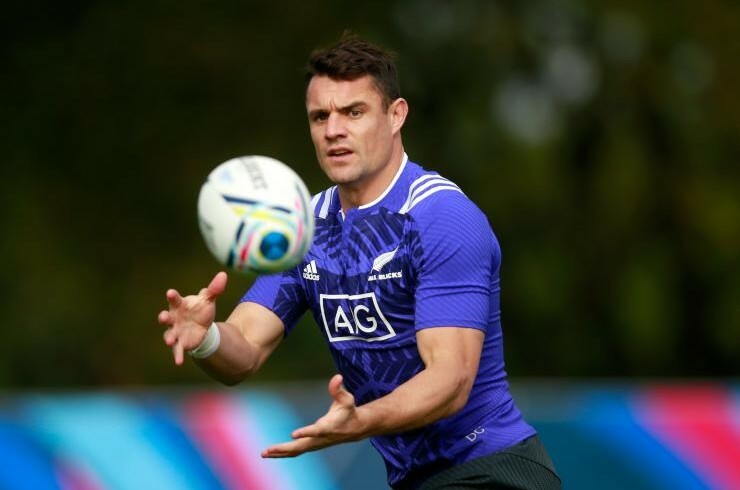 Dan Carter’s superb performance in the Bledisloe Decider – his last on New Zealand soil before he heads off to Racing Metro – was the Carter of old. Barring an injury, you would expect him to be the first choice 10 for New Zealand in the World Cup. We all know not to rely on one New Zealand 10 however. Last World Cup they lost 3 fly-halves to injury, and had to call up Steven Donald to fill the gap. So, the question remains, who should be Carter’s deputy? Who is NZ’s backup if Carter gets injured again? Which of these fly-halves does Hansen take to England for the RWC? Who can he trust as the backup fly-half in a knockout game? I’ll be looking at the different facets of their game – their attack, defence and their goal kicking, and see which player is mostly likely to make the step up if needed. All the stats (unless stated) are from the 2015 Super Rugby season, and are only from their game time at 10, as both Slade and Carter played in numerous positions throughout the season. In regards to Carter, I would take these stats with a pinch of salt. Because of less gametime overall/ a bad first game back against the Hurricanes, his stats can easily be skewed. Whilst he’s admittedly had more game time at 10 this season than his competitors, Sopoaga is clearly ahead of the others in terms of assists, having helped produce more tries than any other 10 last season in Super Rugby. Try assists are counted as the last person to pass to the try scorer. Carter has the least impressive stats of the four, but by far has spent the least time playing at 10 this season, having predominantly played 12 for the Crusaders, with Slade at 10. Barrett made the most metres per run out of the 4. This is perhaps unsurprising, with it being one of the biggest strengths of his game. He made the most metres out of any 10 in the Super Rugby season, and was ranked 11th overall for metres covered by any player; pretty impressive stats for a fly-half. Sopoaga and Slade are similar to each other, with Carter coming last again. They are all pretty similar in their decision-making, except for 1 or 2 stats. Carter and Slade both run with the ball more often than Sopoaga and Barrett, and Slade kicks far less than the other contenders. This could be part of his natural game, however he did have Carter outside him at 12 for most of last season, and he’s not a bad kicking option to have outside of you, or it might have been part of the Crusaders game plan. So far, by the numbers, Sopoaga sets up the most tries, Beauden Barrett is the most dangerous running option at fly half, and Carter’s running game has looked the weakest of the 4 at the 10 position. Whilst Sopoaga is one of the more dangerous options attacking wise, he also conceded far more turnovers compared to the other 3, even taking into account his larger game-time. A weakness of his game that will not have escaped the coach’s notice. Barrett has the best tackle success ratio up at 86%, and Slade next on 80%. Carter has the worst tackle success of the 4 at 10, however – in one one game against the Hurricanes this year, he missed 9 tackles. This was his first game back at 10 for a considerable amount of time towards the end of the season. If you take that game out, his stats read at 88%, the best of the lot. A key part of any fly-halves game. Goal-kicking is crucial, especially in the knockout stages. Who can you rely on to make the crucial kick for territory? Who can convert from the touchline? Unlike the other posts, I’ve included each players stats from the whole season, rather than just playing at 10, as playing at 15 or 12 doesn’t have any influence over the goal-kicking stat. Whilst being the bigger attacking threats, both Sopoaga and Barrett have the worst kicking stats of the 4 from last season, in particular the conversion stats. If the All Blacks are in a tight game, they may not feel comfortable relying on those 2 to kick them to a win. Carter is the most reliable of the 4, which is no surprise. He’s shown many times for New Zealand that he’s the most reliable goal-kicker, and will be aiming to continue his form into the World Cup. It’s also worth noting that the only fly-half to have got any drop goals last season was Sopoaga. This could be extremely useful, especially in the knockout stages, as New Zealand have found out in previous World Cups. Whether it is enough to balance out his less than stellar conversion percentage however, is a question that needs to be answered. Whilst looking at stats can be useful, and they can tell you certain things about players, they do not take into account things such as workrate, timing of the pass, rucks won and lost, and other facets of the game. By the numbers, Carter shouldn’t be the first choice at 10 for the All Blacks. To be a good fly-half however, you need to have good vision, be able to draw in defenders, organising defence, and kicking out of hand: whether it be a clearing kick, a kick to the corner or an up-and-under. These mostly aren’t quantifiable by stats, and watching their games is the best way of judging these abilities. He may not be the quickest, he may not be the strongest, but Dan Carter has become one of the best fly-halves of all time. His ability to know when to kick for the corner, to draw in defenders, and decision making in general are what have put him head and shoulders above the rest. First Carter makes the step past James Horwill, and then continues his run, drawing in Quade Cooper, and passing it at just the right time for Dane Coles. Making your test debut at Ellis Park against the Springboks is not the easiest debut you could have, but Sopoaga looked calm and collected in a tough environment. He had a rocky start, and took some big hits, but quickly recovered to show us all what he’s been doing this Super Rugby season. His run and pass here sets up Ben Smith for New Zealand’s first try at the end of the first half. Playing with his Highlanders teammate Aaron Smith no doubt helped him, and having that linkup in the All Blacks team could be a decisive factor if he does get picked over his competition. Defensively, he’s more of a risk than the other fly-half options. With the lowest tackle success rate, most turnovers conceded and lower goal kicking stats, this is likely the black mark which New Zealand management will be debating amongst one another. Another aspect of the game that may count against Sopoaga is the fact that both Slade and Barrett can both cover a number of other positions in the backline. Utility players are valuable in the World Cup, and it’s definitely possible that Sopoaga could get passed over because he hasn’t got that ability to play more than one position. Barrett has struggled with injuries towards the end of the season, damaging his medial ligament and straining his calf. He knows goal kicking is one of the areas he needs to work on to be considered, however admitted that he had been having hip pains in the build up to the super rugby semi-final because of over-practicing. If he hasn’t properly recovered from those injuries and they flare up during a match, that could be a real problem. His athleticism puts him apart from his rivals, and his versatility to cover 10, 12 and 15 is another feather in his cap. However, his caliber as a fly-half at the top international level has been brought into question. Most notably in recent history, his inability to unlock the Welsh defense back in 2014 was a real problem. It wasn’t until Slade came on that the New Zealand attack starting clicking. Mr Versatile. Slade has played in nearly all the backs positions, slotting in at wing, fullback, centre and fly-half for club and country. It’s something that Hansen has relied on, most recently calling Slade up to the bench for the Bledisloe decider. Slade, like Barrett also injured himself towards the end of the season. The same questions have to be asked, will he hold out for the World Cup? His abilities as a goal-kicker are what give him the best chance of being in the World Cup squad. He’s second only to Carter in terms of kicking percentages. He has no fears tackling the big guys either, taking Nonu head on, resulting in knocking out his mouthguard in the process! In the past, the All Blacks have usually taken 2 fly-halves, and then one utility back, who plays at 10. Sopoaga is the least experienced of the trio, but his test debut showed he can handle the pressure. His lack of versatility will count against him though, perhaps being seen as the starting choice at 10 if Carter were injured, rather than being a bench option. Barrett and Slade are both versatile, making them the more obvious choices as Carter’s understudy. Barrett’s running game and ability to be a serious attacking threat, as well as being defensively sound count has to be tempting for management. Slade, however, is the more complete fly-half. He has a much more rounded game, and his goal-kicking is superior to both Sopoaga and Barrett. Slade would be the more reliable option in a tight knockout game, when kicking goals is vital, but at the sacrifice of a dangerous runner. This would suggest that both Carter and Slade will be in the squad, or that they may be carrying knocks from this weekend. However, the ITM Cup also offers both players one last chance to impress Steve Hansen before he announces his final World Cup squad on Sunday August 31st. It’s going to be close! Interesting. As you said Barrett and Slade are more versatile, a feature that you need at the World Cup. Carter has experience and it looks like he is coming into some form which makes him peerless as a general guiding the team around. Sopoanga is the future and would still be desperately unlucky to miss out. Despite all the speculation we shall just have to wait until 31 August to find out which way the three wise men will go. Completely agree with your comment, I think this tournament may have come a bit too early for Sopoanga unfortunately, but as you say we’ll have to wait till 31st to see who goes!